The Disney Corporation’s relationship with conservative religious groups over the last twenty years has been troubled at best. A decade-long boycott began in 1995, protesting the fact that the company permits Gay Day to take place at Disney World (because refusing to sell tickets to people in matching shirts makes sense) and extends insurance benefits to the partners of gay and lesbian employees. Although there were other objections – Miramax’s release of the movie Priest was high on the Catholic League’s list – these were the focus. As a result, many groups (overwhelmingly Christian, but two Jewish and one Muslim) boycotted and denounced Disney for years. But there can be no doubt that in this war, Disney fired the first shot. Not with their acceptance of homosexuality, though. If these religious groups had been paying attention, the boycott would have started six years earlier. Because 1989 was the year Disney released a film that offered sophisticated criticism of some of the basic tenets of Judeo-Christian beliefs. Disney encouraged children to look for salvation not in the teachings of God but in the independence of the secular world. I’m referring, of course, to The Little Mermaid. The Little Mermaid is a straightforward retelling of the story of humanity’s fall from the Garden of Eden. It is the story of a young woman (Ariel/Eve) covetous of something she does not have (Prince Eric/Fruit of Knowledge), and what it will give her (knowledge/the human world). This desire is forbidden to her (by King Triton/God). But she listens to the advice of something evil (the snake/Ursula), and as a result gains the forbidden knowledge. Ultimately, she leaves the Garden of Eden forever. Both Eve and Ariel decide, with a little encouragement, to buck the rules and choose knowledge. 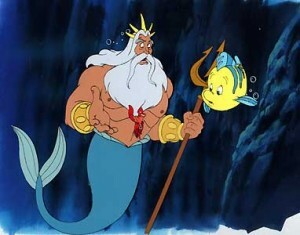 King Triton is a lot like the God of the Old Testament. He has limitless supernatural powers, is the ultimate sovereign, quick to anger, not open to negotiation, and is acting out of love for the children he may well have created with said supernatural powers (I haven’t seen Ariel’s Beginning, and I’m going to carry on pretending that it, like so many direct-to-DVD Disney sequels, does not exist). 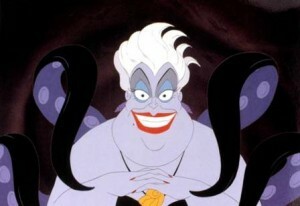 Ursula, following the Paradise Lost Satan storyline, used to live in the palace. She says that King Triton cast her out. Her ambition doesn’t have anything to do with Ariel – she wants to overthrow Triton and rule Heaven (Atlantica). Adding one of the most popular storytelling conventions Satan has going, she operates through the use of contracts that are extremely unfavorable to the signer. She even keeps the tortured souls of her former victims in her yard. The musical numbers help reinforce the religious themes. The opening number features the entire ocean-ly host gathered together to sing the praises of Triton. The repeated love song is not about Prince Eric himself, but about the whole new world he represents. Eve didn’t want the fruit because it looked tasty: the real attraction was that it was “a tree to be desired to make one wise” (Genesis 3.6). Similarly, Ariel doesn’t just want to be with Eric, she wants to “ask ’em my questions and get some answers!” “Under da Sea” is all about the paradise she lives in and risks losing. And “Poor Unfortunate Souls” pretty much speaks for itself (and causes nightmares). Detailing the similarities of the story is fun. But it’s not the point. The point is the way in which they are different. The reason the conservative religious groups boycott of Disney should have just robustly entered its twenty-first year, instead of fizzling out after less than half of that time, is in the way the story ends. Ariel’s decision to make a deal with the devil has consequences, as that decision inevitably does. And here they’re pretty extreme: Ursula gains the powers of God, and – in addition to whipping up a serious storm – starts shooting at Ariel. Things look grim, but then Prince Eric drives a wrecked ship into Ursula, killing her. Let’s think about that for a second. We already know that he’s the forbidden fruit, the manifestation of secular knowledge and defiance of God’s will. And that’s what it takes to kill Ursula. Not King Triton. He agreed to surrender his power to Ursula in order to spare his daughter, but that’s not much of a choice. From the moment Ariel signed Ursula’s contract he was powerless. God could not save Eve from Satan. But Prince Eric could, because Disney believes that people don’t need God to protect them from the influences of evil. What they need to bring to the fight is knowledge. Eve defied God and had a dangerously close brush with evil, but she survived because she was helped by the very knowledge God had forbidden. It’s all very Humanist. And that’s what makes the real difference. Disney gives the Fall a happy ending, because from that perspective it’s a happy story. Mankind escapes ignorance and enters into a world of vastly richer experience. It’s harder, and it’s more dangerous, but it’s for the best. Disney sees that humanity, like Ariel, just wasn’t made for Paradise. And they believe that God recognizes that too. King Triton doesn’t give Ariel legs out of anger, even though the result is that she will leave Paradise forever. He does it out of love, because that is the only life she will truly be fulfilled. There are no curses or punishments. They share a moment of understanding, and then say goodbye, with Ariel sailing into the sunset on the arm of Prince Secular Knowledge. And all these years I’ve detested Disney’s ‘The Little Mermaid’ because I saw it as being about a spoiled girl who does what she wants without suffering any consequences. No, wait, I still do. Haha. The Disney-aholics are the ones I choose that phrase for! Cross referencing is always fun, right? In thinking about your idea that Snow White is better because – despite also being rescued – she didn’t cause the problem, I have to disagree. My small “at least” would be “at least Ariel had some agency!” She did things. Maybe she did things wrong, but at least she could exert influence in the world. She causes problems, but the alternative was to passively accept a life she was unhappy with. Going on having not seen it in a while, my memory of Snow White is that life hands her a pretty raw deal, with barely escaping being killed, but she makes the most of it, making new friends and a new home for herself. (Or at least making her new home a better place, which is a good aspiration for every person, I would think.) In life, we don’t always have agency, except perhaps the agency to choose how we’ll accept a situation. That to me is a very important exercise of agency. This sort of question makes me think of debates of proto-feminist texts pre- and just post-1900. What kind of female protagonist are we going to side with? Yes, all of these women are in a repressive system but some are seen as acting selfishly, others are martyrs, others rebel bravely, some just make the best of their situation, etc. etc. It’s easier to sympathize with the woman who never really gives you a substantial reason to dislike her or see her as a bad person but do actions like abandoning one’s children, adultery, bad behavior/traits mean that the points about gender roles are any less valid? I’ve always liked The Little Mermaid. I don’t it’s ever been so much for the plot as for the msuic, the lovely voice of Jodi Benson, the artwork, that sort of thing. Thanks for giving me something else to think about with this article. Amazingly the similarities never came to me before. I was too busy swimming through the gender role issues being brought up. But then, I always am. Meanwhile, loved the post, I’m a Div School student, so my mind was blown. Confession: not only is “… about the whole new world he represents …” my edit, but I originally titled this post “A Whole New World.” Only this morning, when I was e-mailing Caroline about it, did I realize I’d quoted the wrong movie. This has been your Overthinking It ombudsman. Wow. Well the in-article Whole New World reference is so much like something I would do on purpose, I assumed I had. So, good edit! Excellent article. If Sebastian is an angel, does Scuttle (the seagull that tells Ariel false names for the things she finds) represent the Antichrist, or just one of the pagan prophets of Baal? I’d always thought of “The Little Mermaid” as a tale about the trials and eventual rewards of growing up (with Ursula guest-starring as The Icky Parts of Puberty). Which is in itself an interesting position for Disney to take, since most of their business model relies on infantilization/indulging us in returning to our lost childhoods. I still love the songs, though. ‘Under the Sea’ always gets my feet moving and ‘Part of Your World’ makes me tear up; at least it used to, until the South Park guys came out with their better-than-the-original spoof in their movie, having Satan sing ‘Up There’, which becomes much more interesting satire with your interpretation of “The Little Mermaid”. When I was first putting this together, I tried to find an equivalent religious figure for all the major cast members. Some of the connections were a little tenuous, but I think I settled on Scuttle representing secular scholars. He examines the human world without really being a part of it. Some of his ideas are wrong, but he’s enthusiastic and wants to help someone in the pursuit of knowledge. But he’s one who could go several ways. The Little Mermaid is probably my favorite Disney movie, purely because I think it makes the best use of music. The repetition of “Part of Your World” throughout the film is especially well done. What would Max represent? On one hand, he shows undying devotion towards Eric. On the other hand, he is the only one (Albeit a dog) in the human world who seems to know that Ariel is something more than she seems. Max, as personified as a dog, almost seems like the ‘gut feeling’ that humans have – that unspoken instinct that we have towards the affinity for a god (Seeing Ariel as part of ‘paradise’) while staying true to the knowledge of self (Eric). I would say that he represents an agnostic view of the world. Just my idea. I realize it is horrible, but it sure is fun! 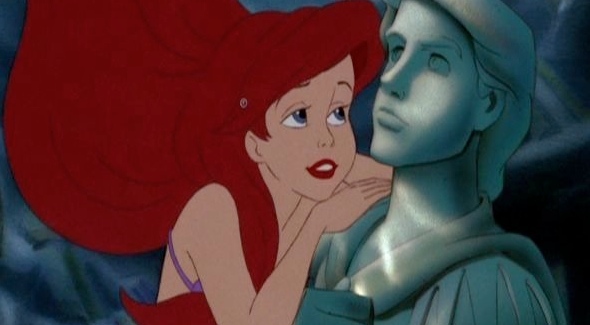 PS – Although I’m not a huge fan of The Little Mermaid as a movie, I love that fact that if you go to any bar and talk to any girl in her mid-twenties to mid-thirties you can say ‘I bet your favorite Disney movie is the Little Mermaid and at worst you’d get “No, but it is my second favorite”. Sebastian most certain is an angel of the Lord. It makes so much sense now. Intentional or not, I never noticed the parallels and this was such a fun article to read. Especially reading under the sea as Sebastian’s ode to the wonders of Paradise. I don’t remember the movie in detail so, not much to add but, yeah, great work of Overthinking It! Triton is like God in the Old Testement? No way! Nice job. While The Little Mermaid is one of my least favorites from that era of Disney films, I’m never against an overanalyzation of Disney. The “contract with the Devil” aspect is especially intriguing to me, and I wonder if there is more to be had than just a vague comparison to other “contract” stories like Faust (or, since it’s still hot in my mind, the Deathly Hallows myth from the seventh Harry Potter book). One qualification to make with regards to The Little Mermaid is that Triton/God takes Ariel/Eve’s place by signing the contract over her name, thereby relinquishing his powers to Ursula/Satan. I can’t think of another “contract” story wherein the God figure submits to the Devil, and maybe that’s how Disney gets the last word in- for, like you said, it takes Eric/the Secular to defeat Ursula/Satan. As someone who is subjected to The Little Mermaid at least weekly, I was glad to see it subjected to a level of scrutiny it probably doesn’t deserve. I cringe at the Disney waifs, but thankfully I can stomach it all much more now. Thank you. Dare I ask, under what circumstances is one forced to watch “The Little Mermaid” weekly, sometimes more than once a week? Actually, we have the abbreviated version of a book with accompanying CD. The CD “reads” the words and makes a sound when they should turn the page. My 4 year old and even my 2 year old can look at the pictures, listen to the story, and turn the page on queue. “Under Da Sea” is played at the end. All told I think it’s about 20 minutes listening to the same song/story over again. So, it’s not actually “forced to watch” as “willing to listen”. Many of the characters are stripped out, imagine Little Mermaid Digest. I don’t know if I cringe at the melodramatic Disney voice over, the objectification / stupidification of women by Disney or the excitement my 4 year old has to “The Princesses” without ever having seen a single Disney show. But your syntax actually writes them out of existence. Well done! Well, if you want to be technical about it, the number of direct-to-DVD Disney sequels that DO exist is vastly smaller than the number of direct-to-DVD Disney sequels that DON’T exist. And G*d bless them for that! Even though they don’t exist. Yet. The first picture in this article made me think of something. What significance does the statue have? If I’m remembering the plot correctly…after she sings “Part of Your World” she climbs up the side of the ship and watches Eric and Max. She seems attracted to him on a purely surface level “He’s very handsome, isn’t he?” The statue is then revealed as a very special, very expensive, very large birthday present. The statue portrays him as a warrior, brave, confident, defiant, with skewed proportions of “hyper-masculinity”. Eric makes a face and Max growls at it. Then the storm happens and Ariel rescues him. A while later, Flounder surprises Ariel with the statue. She cries “Flounder you’re the best! It looks just like him! It even has his eyes.” Later, of course, she interacts with the real Eric. Also, the idea that “The repeated love song is not about Prince Eric himself, but about the whole new world he represents” is further supported by the fact that she doesn’t know he exists when she sings this song. The “your” is more of an abstract “your” as in a representation of the human race, or the entirety of humanity, or a vague ideal companion she may be imagining that she’s speaking to. I’ll admit, I did not give the statue tons of thought in my parallel to Genesis. The Fall is not exactly a 90 minute story on its own, and Disney still has to sprinkle in some crazy gender stuff in a princess movie. However, I do like the idol idea. We could just say the main framework is the Fall, and they decided to fill in the story gaps with whatever religious imagery they could make aquatic and animate. So, does this all mean that Flounder is an Adam that has to live without his Eve? I’ve had one planned about Mulan and evolving gender dynamics for years. But I’ve been busy with a different guest article. Sigh… I’ve had one in the works for a while, too. Maybe I’ll work on it over winter break. Huh. Sounds like we might need a theme week. The one that’s occupying my thoughts has something to do with progress and the marketplace in The Princess and the Frog.